Oakley decided to revive the nostalgic Oakley Frogskin in 2007 and it is safe to say that it was a well received move by the sunglass powerhouse. The Frogskins"first introduced in 1985 and originally available in over 50 colors, the Oakley Frogskin was a part of the 80’s pop culture, a time like no other. Ronald Reagan was in the White House. “The Terminator” was in the box office and Run-D.M.C. was in certified gold. We have resurrected the original tooling from the early ‘80s to produce new limited editions, giving today’s culture a chance to own a piece of history." 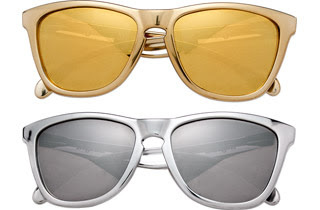 These shades showed up this week on almost every blog I read. 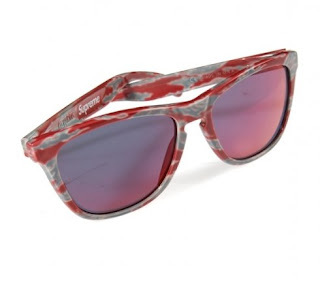 These unreleased Supreme x Oakley Frogskins are done up in a Tiger Stripe red and grey camouflage colorway. No release date is set. 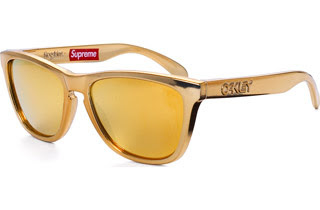 Though stunning I would still chose a pair of the the November 2007 release of the chrome and gold Supreme x Oakley Frogskin any day.